It is said to "Beware of Greeks bearing gifts." I couldn't image a more foolish idea. Greeks have given the world so many wonderful gifts... their contributions to philosophy, architecture, literature, mathematics, language, art... and FOOD.. is just astonishing! A Greek would never come to your home empty handed, even if he only brought a small basil plant to lift your spirits with it's appetizing scent. The Greeks invented the idea of the Guest-Host relationship... at least the European version of it. For Food of the World this month I am sharing with you a simplified version of a traditional Greek dish called Briam. You basically take whatever vegetables are in season and cut them into thin slices, and layer them. There are different versions of this dish; most put tomato sauce, garlic, and other herbs, maybe basil or oregano, between each layer. I chose to top this dish with fresh tomatoes and not use tomato sauce. You can top Briam with cheese if you like. 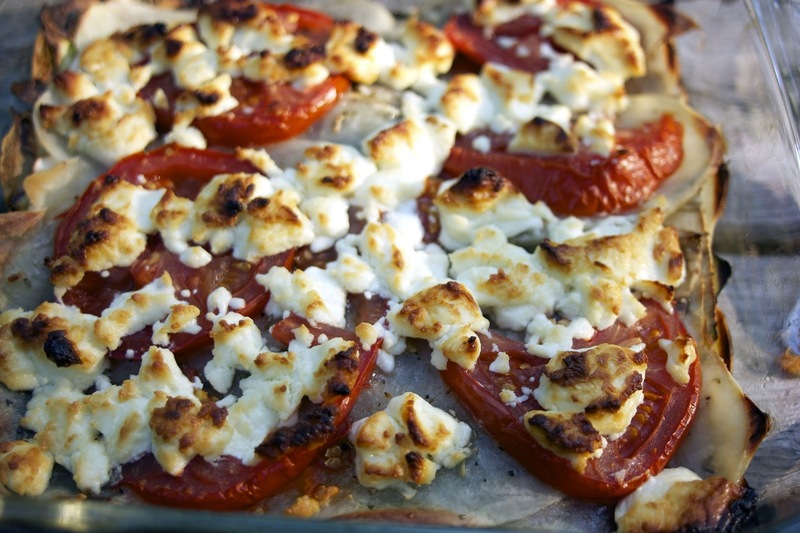 I used goat cheese, but mozzarella would work well, or just a sprinkle of parmesan; would be delicious too. A layer of cheese make this dish a vegetarian main course. 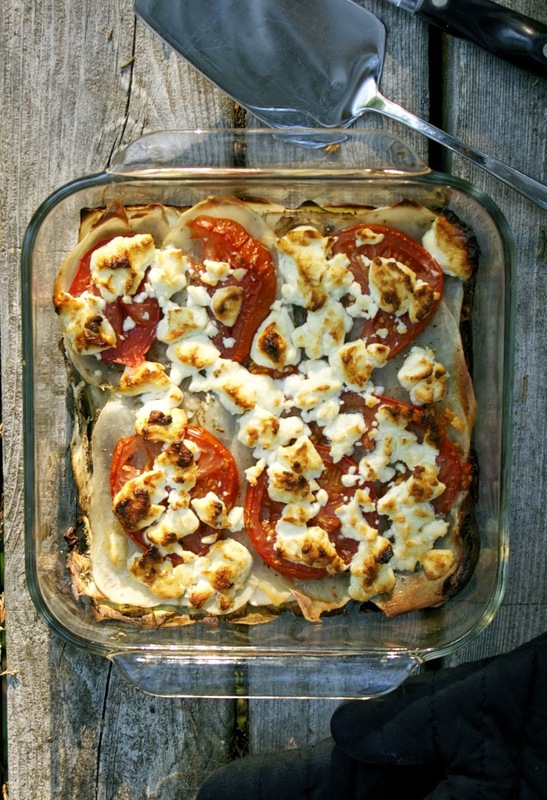 If I was serving this casserole as a side dish I would not add cheese, in order to keep it light. Play around with this, have fun with it... use any vegetables you have on hand... especially the ones in your fridge that may be starting to get bruised. It doesn't matter what they look like once you slice them and bake them! 2) Peel potatoes. 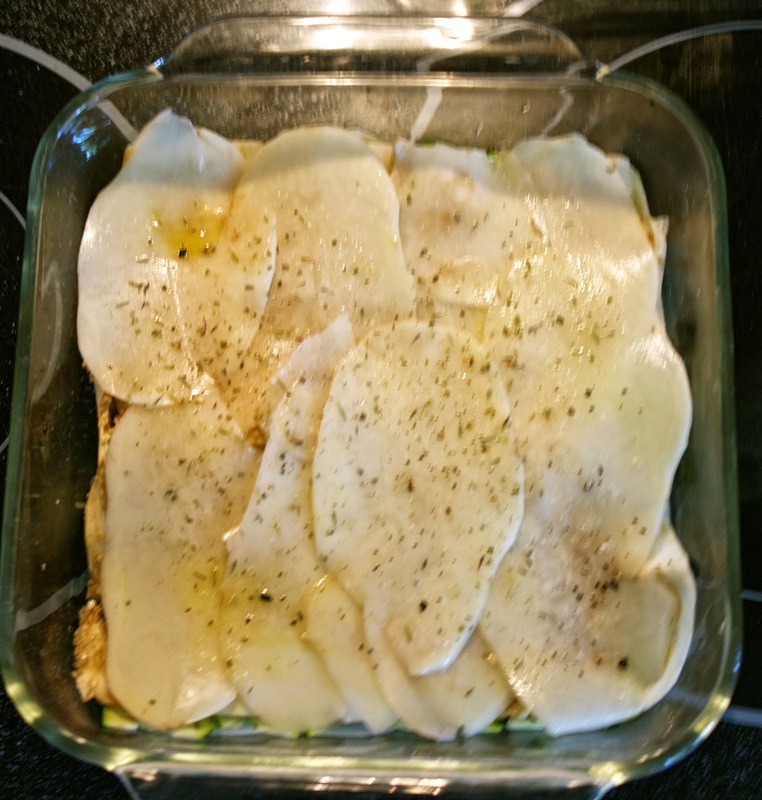 with a mandolin or other vegetable slicer make thin slices of potatoes and put them down in a medium baking dish such as a 9" by 9" pyrex baking pan. Slightly overlap the potatoes. 3) Brush the potatoes with EVOO. Sprinkle salt, pepper, and a little bit of basil on top of the potatoes. 4) Follow the same procedure with the next vegetable. Put the heaviest vegetables on the bottom and the lightest on the top. With this mix the order would be: potatoes, zucchini, with the tomato being the last layer. 5) Top the casserole with cheese and bake it for 45 minutes or until the hardest vegetable (potatoes) can be pierced with a fork. 6) Let sit for at least 5 minutes before cutting. Great served warm or at room temperature. Terrific for picnics because it can sit outside in the heat for hours. Come Join us on August 12th when we visit: India! Please add your Greek recipes to the linky below and visit my co-host to see what they are cooking in Greece today. 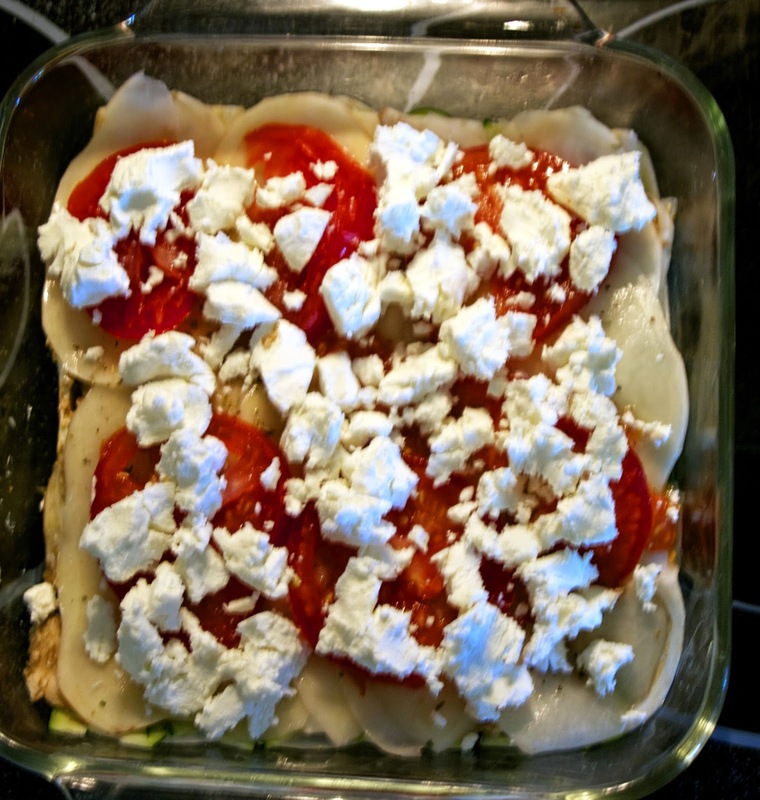 oh you know I almost picked up Goat Cheese today, but went with Feta instead! Now I wish I had. I will need to keep this dish in mind when I clean out the fridge. 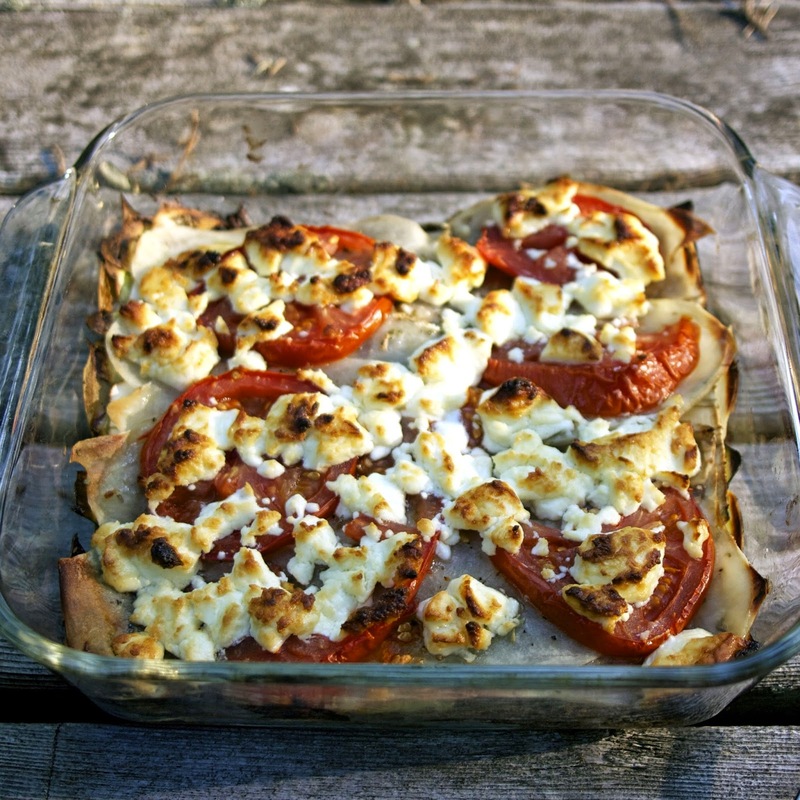 I like Feta in a salad, but prefer goat cheese for baking. Yes, this is really a good fridge cleaning recipe. What a great dish to present for our visit to Greece, this looks like one I will be trying this summer. It is so much fun cooking with you on Foods of The World! I have really been enjoying checking out new cuisines. Yumm. Looks like a great way to eat those summer veggies! 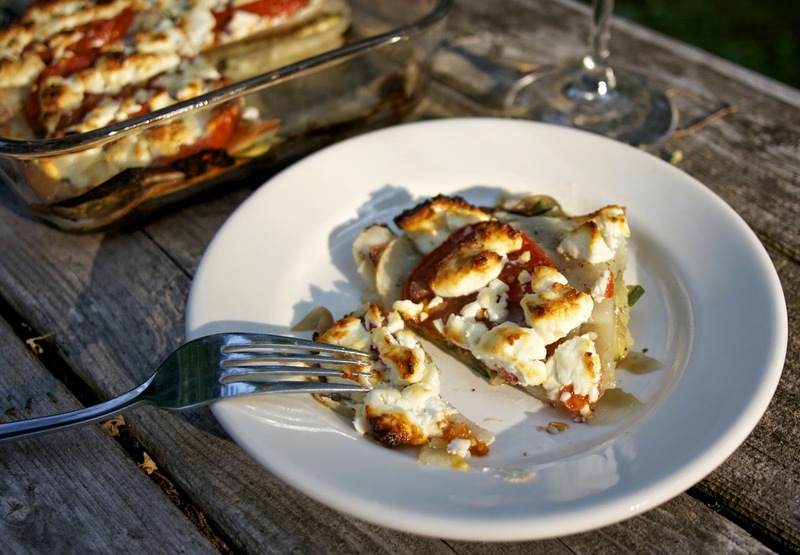 Yum - I love Greek food:) This looks like the perfect summer recipe! Delicious thanks for sharing with Hearth and soul blog-hop, pinning it. So glad that you could share this awesome party with Full Plate Thursday! I like the idea of making this with whatever is in season at the time. Thank you for sharing. What a wonderful casserole, Diane! I agree, Greek food is absolutely amazing. We ate so well on our visit to Athens! Thank you for sharing another delicious post with us at the Hearth and Soul hop.